Atlas School honors and embraces students' unique minds, spirits, and voices. Empowered communication and respect for student's passions and abilities ease them into rich social and emotional relationships and experiences. Self-identity, growth and joyful engagement join with academic learning and choice-driven community integration to aid students in pursuit of their own life goals and happiness. 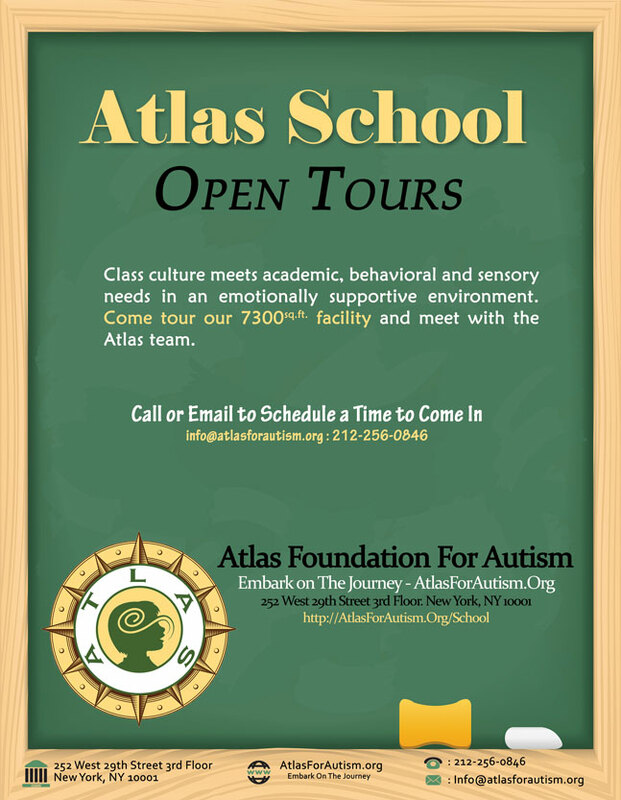 The Atlas School is a non-profit, non-public New York City (NYC) school serving children and young adults aged 7-21 years diagnosed with Autism Spectrum Disorders and other developmental differences. A truly individualized full-day educational program is developed for each student. The program uses a multi-strategic approach, data analysis as well as evidence-based and cutting-edge interventions and techniques. Core to every student's program is their social-emotional development and deepening of communication skills. The school's curriculum, the Atlas Map, addresses the whole child in a comprehensive manner and involves working with students across all areas of development. We place a heavy emphasis and top priority on communication as it is integral to every other portion of a student's life and is the cornerstone to lifelong social learning. With an effective means of communication, our students can engage in a limitless number of interactions where they will learn about the world, other people and themselves. 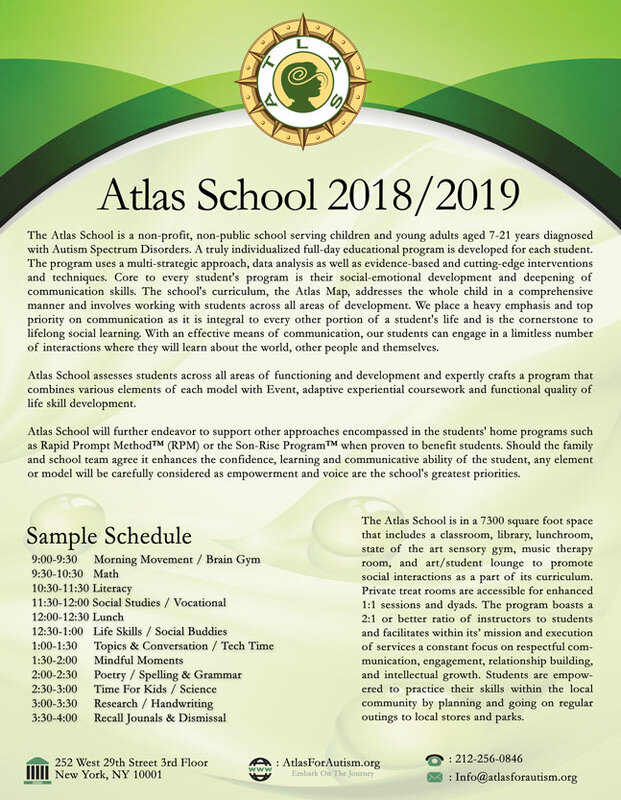 Atlas School assesses students across all areas of functioning and development and expertly crafts a program that combines various elements of each model with Event, adaptive experiential coursework and functional quality of life skill development. Atlas School will further endeavor to support other approaches encompassed in the students' home programs such as Rapid Prompt Method™ (RPM) or the Son-Rise Program™ when proven to benefit students. Should the family and school team agree it enhances the confidence, learning and communicative ability of the student any element or model will be carefully considered as empowerment and voice are the school's greatest priorities. the NYC special education system can be a daunting task and we are here to help. If you have a child with or without a diagnosis of an Autism Spectrum Disorder or other learning disability and are in need of assistance, give us a call. Atlas School prides itself on meeting all aspects of our students IEPs. We provide counseling, Speech, and OT. Our school does NOT currently provide PT. Atlas team members work together with parents and the BOE to create and implement the most relevant and appropriate goals for our students promoting the greatest elements of progress possible. Our school psychologist , teachers, and data team focus on IEP goals throughout all aspects of the school day embedding goals into our curriculum and even formalizing data time to improve test taking skills. Ansers: Beliefs about ABA (Lets discuss the pros, cons and controversial ins and outs of ABA and Autism! "How we define behavior, Autism, and appropriateness is a tricky slope to navigate and one bombarded by subjectivity and emotion.."